Dubai Municipality has announced the opening of its Quranic Park, a first-of-its-kind project in the world, built at a cost of Dh200 million ($54.4 million) in Khawaneej region of the emirate over a sprawling 640,000 sq m area. Among the most important elements of the project is the Glass House containing the plants mentioned in the Holy Quran and Sunnah, which grow under certain temperatures and special environmental determinants, reported state news agency Wam. The glass house features a distinctive architectural design at the highest point of the park, allowing visitors to see all its elements, in addition to a cafe surrounded by trees and plants. The park is surrounded by a low wall that reveals its beautiful features, a Moses Stick Miracle Lake and shops that sell herbs and plants mentioned in the Holy Quran. It also comprises solar energy trees that are inspired by the art of Arabic and Islamic fonts, designed specifically for the park that also contains solar panels, Wi-Fi, and phone-charging stations. Two areas have been allocated for children from 2 to 12 years, shaded with palm trees, in addition to shaded seating areas decorated with patterns inspired by Islamic art and architecture, said the report. There is also a sandy walkway and another one dedicated to exercising and a cycling track, Wi-Fi, and phone-charging stations it added. During the first week of opening the park received 100,000 visitors. Dawoud Al Hajri, the Director General of Dubai Municipality, said: "We have developed this park to promote the Islamic cultural and civilizational roles, as the park contains cultural elements that bring closer the interaction between different cultures." "It also comes within the policy of increasing the green area in the emirate and the diversity of different landmarks. The park will be an important attraction for citizens, residents and tourists alike," he stated. 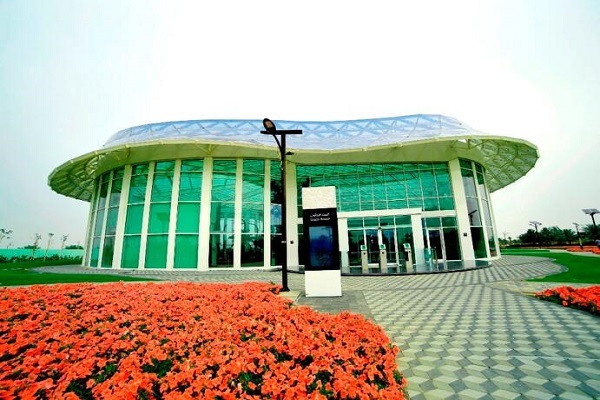 "In addition to its Islamic character and innovative concept, which make it a unique first of its kind project in the world, the Park is characterized by its modern designs and a number of international specifications. It also has its beautiful green landscapes and diversity, and the exhibits promote the dissemination of a culture of tolerance," he stated. "Entry to the park is free of charge with fees only limited to the Cave of Miracles and the Glass House at Dh5 each and a Nol card can be utilised to pay entrance fees," he added. Faeqa Akram, the Architectural Engineer at Dubai Municipality, said the park consists of 12 gardens containing 45 types of plants mentioned in Quran and Sunnah, including bananas, pomegranates, olives, melons, grapes, figs, garlic, leeks, onions, corn, lentils, wheat, fennel seeds, ginger, tamarind, basil, pumpkins and cucumbers.